Today we are going to share our favorite salad recipes. When people think of salad, they think of summer, picnics and backyard barbecues but I enjoy a good salad anytime of the year. Especially a fruit salad. This salad is easy to make and tastes great. During the holidays we tend to over indulge in heavy dishes and snacks. 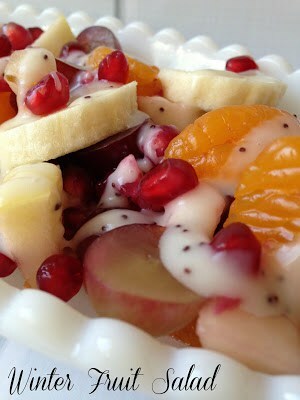 Winter Fruit Salad is always a welcomed sight. Every once in awhile I come across some large, juicy navel oranges but nothing ever compares to the oranges we bought while she was in band class. What I won’t give to have a box or two of “band class” oranges. When my daughter was in the high school band, many moons ago, each year they would sell citrus fruit. Ever since then, I seem to crave citrus fruit during the winter months. There is something comforting about eating an orange while it’s snowing outside. In a large bowl, toss together all of the fruit. Squeeze lime juice over fruit. Pour the dressing over the top and gently toss to coat. For best results, serve immediately. 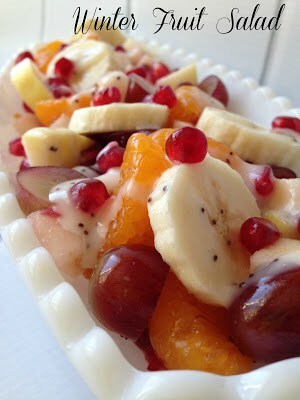 Another fruit salad recipe you’ll surely love. Festive Fruit Salad. Such a beautiful, refreshing salad! It would be a great addition to any menu! This salad is truly a favorite.